On the 6 October 2013, in Cairo, on the 40th anniversary of Arab-Israeli War, everything that could have gone wrong went. It was bit like that great short novel of the Columbian writer Gabriel Garcia Marquez: ‘Chronicle of Death Foretold’. On the 6 October 2013, in Cairo, on the 40th anniversary of the Arab-Israeli War, everything that could have gone wrong, did. It was bit like that great short novel by the Columbian writer Gabriel Garcia Marquez: ‘Chronicle of a Death Foretold’. Everyone knew that there would be murder, brutal and cold-blooded, and there was candid talk about its inevitability for days and weeks. But nothing was done to prevent it and nobody really intervened. On that ill-fated Sunday, since the early morning, a constant flow of vehicles took millions of city-dwellers away from the capital to the countryside. There were bomb threats on Nile Street, around the now closed Sheraton Hotel, where at least 4 people had died just two days earlier. There were rumors, constant shouting, and inconsistent flows of information. Armored vehicles belonging to the police force, countless military tanks, and tens of thousands of soldiers and riot police, took positions on the main arteries, squares and bridges. There was total hysteria, fear, and chaos. A poisonous brew of local teargas was adding to Cairo’s pollution problem. “Drive forward!” I ordered him but he was shaking, refusing. His wife was calling him on his mobile phone, begging him to drop me in the middle of the street and rush home immediately. He was panicking, he began to cry, and then he started to reverse, almost hit an ambulance, managed to create a small traffic jam, and finally drove the car into a tunnel. The bridge was covered with armed forces. The one imposing burned-down building of the old Mubarak company appeared directly across the River Nile, on our right side. Next, the National Museum emerged, suddenly so pathetically small, compared to all this contemporary mess around. And then it was suddenly there, right below me – the old worn-out symbol of the 2011 Revolution, Tahrir Square, and the streets leading to it from all directions. Loud and cheering supporters of the Egyptian army chief, Gen Abdel Fattah al-Sisi and his cohorts were now blocking almost all streets. They were holding Sisi’s portraits, and those of many other ‘leaders’ of the coup, as if they were religious banners. Then, as in this moment, both sides waved enormous Egyptian flags, shouting patriotic slogans. There were tanks and hordes of security personnel, checking on people trying to enter the square. I left the car and began filming, but immediately a group of bystanders began blocking my film and camera lenses: “No!” they screamed, pushing me. “No!” slum dwellers screamed at me, even trying to hit me, when I was, earlier in the day, trying to work in two miserable neighborhoods. “No!” when I was filming the garbage-clogged waterways of Giza, or filthy and unkempt tram tracks in Heliopolis. The aggression of those “no’s!” was so extreme, so violent, that is exceeded even the verbal violence in some war zones like East Kivu in DR Congo. I was aware of the situation. Two days earlier, I was caught in crossfire between Sisi supporters and hardened Muslim Brotherhood cadres. Stones were thrown at me, I believe by both sides. I kept working, and what I saw from above and from street level did not appear encouraging. Even the chumminess of the military and their supporters could hardly maintain the appearance of friendly and comfortable coexistence. All of Egypt appeared to be totally on the edge, jumpy, at war with itself. Armored police vans were penetrating cheering crowd and ambulances were howling; tanks were holding positions and aiming at the civilians. Cars were honking, children were waving flags, and crowds were pushing and being pushed towards Tahrir Square, and away from it. It was around 15:00, and everybody knew, in fact had no doubts, that at exactly 15:30, after the prayers, members of the Muslim Brotherhood would leave their mosques and head directly for confrontation with the crowd of Sisi’s supporters and the security forces. Brotherhood people have an extremely clear view of the situation, even if it is a somewhat single-minded one: their democratically elected President, Mohammed Morsi, was overthrown by the military in the July-2013 coup, then consequently thousands of people were murdered, disappeared, and imprisoned. In August, scores of citizens died as the military ‘cleared’ camps filled with the protesters. “How many died?” I want to know. I am monitoring the situation, through my direct contacts and friends, doctors and intellectuals in Cairo, Port Said and Alexandria. These are people who never abandoned the struggle, the original ideals of the Arab Spring, of the revolution that is supposed to be serving the ordinary people of Egypt. “We are fighting for a socialist society, not only for a so-called democratic Egypt. We are struggling for what can be described as ‘real popular democracy’. And from that position we are antagonistic to both forces - the deposed Muslim regime, and the old regime of Hosni Mubarak,” explained Wassim Wagdy, one of the legendary leaders of the Revolutionary Socialist Organization. “70% of the population lives in dire misery”, explained Mr. Maher Abdelmalek, a sociologist. I ask him what it means to be poor here? Mr. Abdelmalek does not go all the way. He is analytical and cautious. He does not dream about fundamental changes in Egyptian society. He supports the military. He believes that soldiers can bring order and stability to Egypt. He is Egyptian patriot. He does not like foreigners too much; he does not trust them. He does not necessarily trust me, either. But like most Egyptians, he somehow does not connect the military and enormous foreign aid flowing from the United States and Europe. He does not want to hear about it even as F-16s and Apache combat helicopters are roaring above the capital city. “Are they intimidating the opposition?” I ask. I know that he knows that tonight, people will die. That many people will lose their lives. That the military hardware provided by the West and owned by the military, will open fire on unarmed citizens. I know that he knows. He knows that I know. We shake hands and we part, pretending that it is business as usual. Now in Egypt the situation is horrendous. It is not just bad, or serious, it is actually not unlike the situation after the 9.11.1973 coup in Santiago de Chile. And the numbers of casualties are similar, too. People are being killed, and disappearing. Like in Chile in 1973, there is a substantial number of those who believe that Egypt is ‘being saved’ by the military. Of course Morsi is not Allende, and the structure of Egyptian society is totally different from that of historically well-educated and middle-class Chile. But the military coup itself, the way society is divided, and the aggressiveness of the upper middle and upper classes – that is something that makes the two places and two historic events look strikingly similar! In Egypt now there is false and vulgar nationalism everywhere. There is flag waving and worshiping of the top military leadership. I witnessed photographs of General Sisi being kissed publicly in the middle of the street. In Egypt, connecting nationalism and the military is totally absurd. Like in Indonesia and Turkey, the Egyptian military has actually been committing treason for years and decades, by taking direct dictates from the United Sates and the West, as well as substantial amount of cash – 1.3 billion US dollars annually, second only to Israel, to be precise. And that uneasy, in fact ghastly relationship between the Muslim Brotherhood and the Egyptian military goes way back to the pre-revolutionary years. 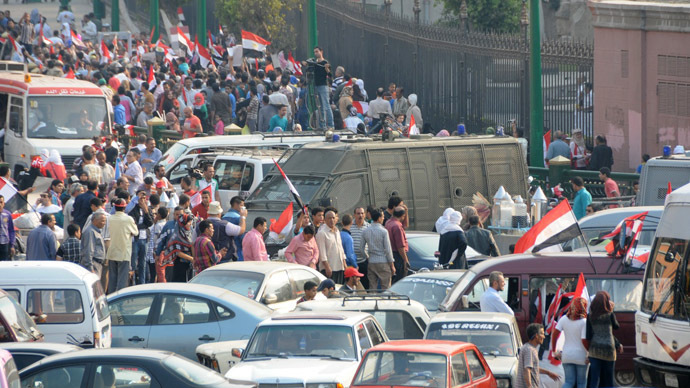 The Brotherhood had been marginalized, intimidated and liquidated by the pro-Western regime of Mubarak. Its members were being regularly kidnapped, raped, tortured and brutally murdered, according to many testimonies. The Muslim Brotherhood’s ordeal was even immortalized in the iconic Egyptian contemporary novel called “Jacobean Building”. It appears that the pro-Western elites, fully disconnected from reality, are fully supporting the military, while the poor people are divided. Educated professionals and organized labor are often with the secular “Movement of 6th of April”, or with The Socialist Revolutionary Organization. Appointments get cancelled. Nobody trusts anybody. There is lack of trust even inside the movements, even amongst the allies. I know he is right. I see skirmishes between neighbors in plain daylight in neighborhoods like Bulak and Imbaba. And then it comes: Sunday, 6 October, 2013, 15:30. I am on the bridge. My driver, horrified is hiding inside the car. Screams are heard: “Brothers are coming!” Nobody knows from where. I jump inside the car. I want to search for the Muslim Brotherhood, while my driver wants to escape. As we drive on the elevated highway, the carnage and insanity suddenly erupts right underneath us. “Stop!” I scream, but he tries to accelerate. I have no choice. I open the door and pretend I am going to jump out. It works. He slams on the breaks. I roll out and crawl to the railing. There below desperate men are jumping over the fence, some holding their children, expressions of fear and desperation on their faces. A cloud of teargas is hanging in the air. Fighter jets are flying over the city. There are screams and then live rounds are fired; I don’t know whether into the air or directly into the crowd. Celebratory firecrackers are producing almost the same sound as teargas canisters. Then gunfire is heard. People are running, falling, and then running again. There is no logic in all this. The military wants to retain its hold on power. The Brotherhood wants to come back and rule. It is not about social justice, or education, or alleviation of poverty. It is not about jobs or even about in which direction Egypt will go, politically or ideologically. It is not really even about Egypt, anymore! People below me begin to automatically and systematically kill each other. I am automatically and systematically pressing the shutter. They are good at what they are doing and so am I. Nothing makes sense anymore. That beautiful dream and that compassionate Revolution, that Arab Spring are all dead! During that day and night, at least 54 people died. 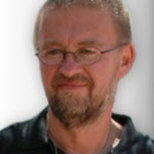 Andre Vltchek - novelist, filmmaker and investigative journalist. He presently resides and works in East Asia and Africa. He can be reached through his website or his Twitter.